Under the pilotship of the legendary, Johnny King, 1988 saw 4th division Tranmere Rovers fans hit Wembley Way, for the first of many eventful visits. This year saw the Football League celebrate its 100th birthday, and thus the Football League Centenary Trophy was born, (although due to sponsorship most of us will remember it as the Mercantile Credit Football Festival). The Football League, even went as far as suspending the whole of the football programme on the weekend of 16th/17th April and hoped for a huge turnout at the historic national stadium. Tranmere qualified, as one of 16 teams, due to an impressive run of results between December 1987 and March 1988. Eight teams came from the old 1st Division, four teams came from the old 2nd Division, and two each from Divisions 3 and 4. 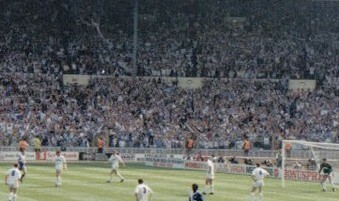 The thought of playing the likes of Everton, Liverpool, Manchester Utd, Villa, Blackburn, Palace, Leeds, Newcastle, Forest, Sunderland, Wolves, Luton, Wigan, Sheff Weds and the FA Cup “winners in waiting” Crazy Gang of Wimbledon, was enough to get many of us long suffering Tranmere fans dreaming of Wembley glory! For four young, skint, twenty somethings, who had travelled far and wide with Rovers, this was an opportunity not to be missed. My better half thankfully had an uncle in West London, who agreed to let us all sleep on his lounge floor for the weekend. This meant that we could actually afford the train fare and a ticket to attend both days of the festival, in the remote hope that Tranmere would actually make it past the “big boys”! Arriving at Wembley Park tube station, wearing our traditional white and blue, we mixed with the multitide of colours worn by our competition. That march up Wembley Way, which turned out to be the first of many, will always stay with me. The sight of the quintessential, twin towers of Wembley, brought a tear to my eye. Our small, but noisy band of Tranmere fans had finally made it to the home of football! Now onto the games. Tranmere were drawn to play Wimbledon in the first round. Wimbledon were then at their peak, having played in the top flight for the second season, finishing seventh that year, and as FA Cup winners, beating our red neighbours in the final! In front of a crowd of 41,500, Tranmere came out and fearlessly tore into the Crazy Gang. Dave Martindale’s goal proved enough to knock out our first division opponents. The two sections of Tranmere fans enjoying every moment of their experience, whilst personally, I kept having to pinch myself to believe we were not only at Wembley, but we actually won the game! The quarter final saw us face a Newcastle United side featuring a young, enigmatic Paul Gascoigne. In claret and blue, Tranmere, orchestrated by a majestic Jim Harvey, played some quality football. Goals from our flying winger, Johnny Morrissey and our very own, goal machine Ian Muir ensured a remarkable 2-0 win. The fans went wild with delight, we were in dreamland! We were lucky that we had planned to make the most of our trip, and we had tickets for the matches on the Sunday. Many other Tranmere fans, scrambled for accommodation and tickets! So after spending an uncomfortable night sleeping on the floor, we hit Wembley again, with 17,000 other diehards. The semi final was against Nottingham Forest, one of the elite in those days. Their team included Stuart Pearce and Nigel Clough, but Tranmere continued in a similar vein to the previous day. Ian Muir scored a magnificent brace but unfortunately, the League One team managed to secure a 2-2 draw. Sadly, Tranmere lost on penalties and Forest went on to beat Sheffield Wednesday in the final.